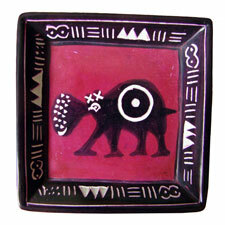 Invite a zebra, an elephant, a giraffe, and a hippo into your home with the Safari Animals Dish Set in black and red. This set infuses African craft with modern design. Hand crafted from soapstone and natural dyes from western Kenya, this dish set is great as a decorative accent or for dried goods. Set of four. Dishes measure about 3" square.